And there is a dear passenger Margaret from 1959. Memorial coin from the Boeing 707 Inaugural Flight. Margaret made it into a necklace to wear. Moments remembered from here to eternity. The Friday before the exciting trip, the car thanked us for a 60,000 mile maintenance check by the Volvo dealer, and it was ready for a road trip to California. I was thrilled to take this touring adventure with Gene; the clothes laid out for my anticipated book signing in San Jose; even the pens that wouldn't bleed on the books. Details all taken with serious intent. Followed by a week of madness. It happened! The main water line from street to house decided to tell us that it was old, well it had been under the ground since 1926, old house you know. Expensive! A planned three day doTerra convention and in a spare moment corn to freeze for winter grab detoured the packing. Now! As the suitcases were down and readied for the trip, Lucy Dog and the two cats started to fuss. Stop it! We are going! Then a phone call from my dear cousin announced that they had the opportunity to visit at the same time of our extended trip (San Jose, Los Angeles, Prescott and Vegas.) Oh, no! I want to see Effie! After a round of Doctor visits, I thought we were ready to go. Well, yes, I should freeze the peaches that were waiting to be done. Uh oh! After a trip to the heart doctor, the doc said, “Good to go!” Wow! Next Friday with the car packing done, we were ready to drive to San Jose for the signing. I said I wanted to relax and soak in the tub for a moment before we said farewell to our home and animals. Why wouldn't the hot water faucet turn off and why was the tub filling faster than I could dip the water out of tub into toilet! “GENE, turn the main water line off! !” He hurried for tools, out to the curb and down on his knees. Off went the water and out went his back! Now to get to the airport! And Saturday morning at 3:00 AM, as I went to the garage to get the car out, the sprinkling system was geysering! Then I discovered that the low beam light warning indicator was on! No! I was determined! It rained big sheets of water all the way to the airport. I missed a turn to the right parking lot, had to circle and land in the right spot. Gene had a difficult time getting to the plane. Back really hurt! We had experienced opposition. Lorraine, the niece of 97 years Margaret who had been a passenger on the Boeing 707 jet Inaugural Flight, met us at the airport. What a rewarding welcome. Off to the care center for the day's activities. The Atria Chateau Gardens chef had prepared Inaugural Flight food, with all the trapping of gracious dining. And there was Auntie Margaret! Yes, Margaret with her bright mind, engaging personality, and warm greeting was alive and happy! After meeting her on January 25, 1959, she as a passenger and I as a stewardess on that historic flight from Los Angeles to New York, this current meeting also felt historical. Incidentally, New York had her winter coat on to welcomed us with a band, and interested and interesting people to greet us. After the photographers took tons of pictures we went down to the large activity room. “Auntie” Margaret shared with me that Liz Taylor had once recuperated at this facility. The activity director was a lovely young lady who had designed the setting which was astonishing. As we approached the room, I was surprised to see a landing strip positioned on the floor with all the markings created with white tape. A banner which read American Airlines and plane windows to look through. Auntie Margaret walked down the strip with all the guest standing or seated with some of us behind her. 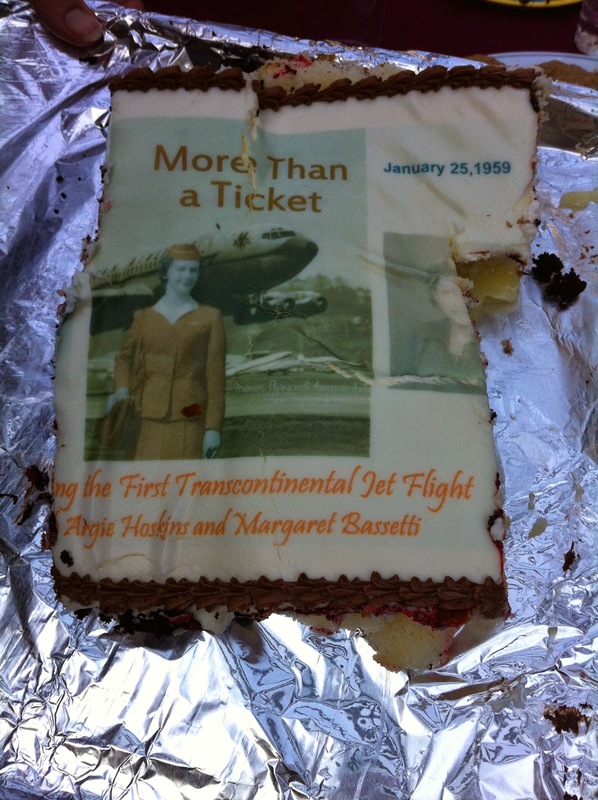 Some of us included two other former American Airlines stewardesses whom I invited to join me on this super adventure. We had all been based in LAX at the same time. 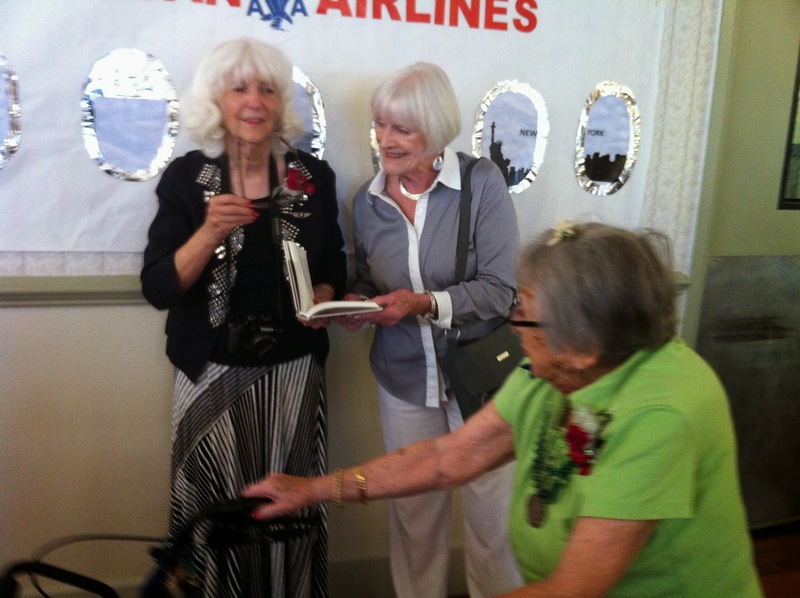 Lona had been on the New York to London Inaugural Flight and Joan on the Inaugural Flight from Los Angeles to Philadelphia. And I on the Inaugural Flight from LAX to New York. 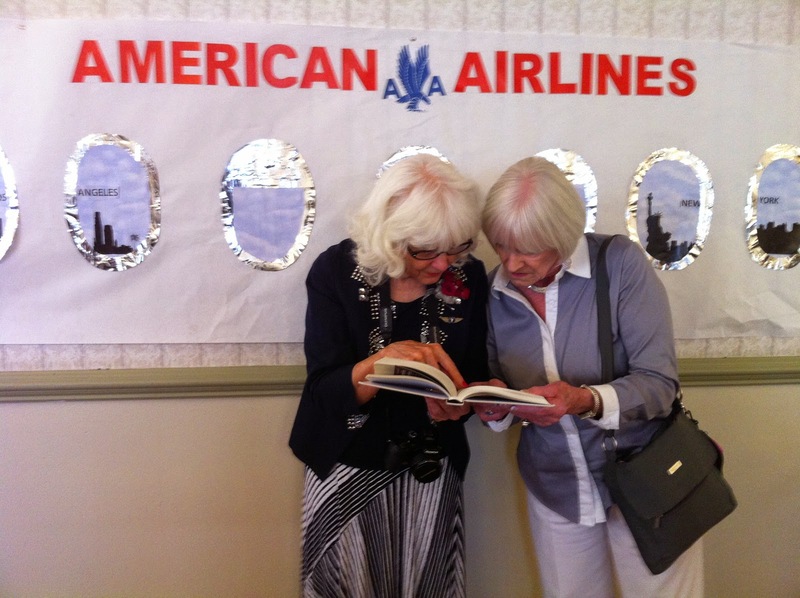 The room was decorated with American Airlines colors hanging all over the place. So Charming! The activity director . . . did an outstanding job with the voices from the 50s belting it out with love in their hearts. And yes, there was Dino with his amazing voice to charm the attentive group for this very special day for Auntie Margaret, made possible by her dear and dedicated niece Lorraine. It was so fun for me to sign book after book as I acquainted myself with the care center's friendships and Margaret's terrific family. A reunion which Lorraine had pulled together family not only from California but from Las Vegas and Oregon for Auntie Margaret to enjoy and some of whom she had not seen for years. Can you imagine the hugs of joy! This was so fun for me! One of Margaret's friends came over to the signing table after I had spoken a few words to announce that we belonged to the same church. Something that I had said impressed her to ask. Connections everywhere! And then to return to Lorraine's lovely home for a delectable meal host by Lorraine and her dear family. Food arranged by the family.... and well you know the Italians, they are so friendly and warm. Loved it! Next day Sunday. After another meal at the Green Cow/Sherwood Inn we happily went back to see Auntie Margaret. I love that lady! One of my dear former passengers aboard that first transcontinental jet flight with the great company of American Airlines. And cousin Effie and her husband will be here tomorrow for an exciting visit. Plans change and things work out for the better with a peaceful landing. Oh how exciting! You ladies are still beautiful! How wonderful that Margaret was there too. Glad you were determined to make the trip in spite of everything going wrong at the last minute. Doesn't that always happen! By the way, I have finished reading your book and enjoyed every page. I felt like I was right there with you.